Monday, March 25, 2019 – Today Insilico Medicine, a biotechnology company developing the end-to-end drug discovery pipeline utilizing the next generation artificial intelligence, and the Scheibye-Knudsen Lab, University of Copenhagen, announce the presentation of Anne Bertolotti, Ph.D., FMedSci., Neurobiology Division MRC Laboratory of Molecular Biology, at the 6th Aging Research, Drug Discovery, and AI Forum during the Basel Life Congress, September 10-12, 2019, Basel, Switzerland. Dr. Anne Bertolotti will give a talk titled “Power and benefit of selective phosphatase inhibition for neurodegenerative diseases” presenting approaches aimed at helping cells to survive protein quality control failures, which can be useful to prevent protein misfolding diseases, including the devastating neurodegenerative diseases. The deposition of misfolded proteins is a defining feature of many age-dependent human diseases, including the increasingly prevalent neurodegenerative diseases. Why misfolding-prone proteins accumulate in aged cells remains largely unclear. Cells normally strive to ensure that proteins get correctly folded and have powerful and sophisticated protein quality control mechanisms, to maintain protein homeostasis under adverse conditions. However, with age, the cellular defence systems against misfolded proteins gradually fail, leading to the accumulation of misfolded proteins with devastating consequences for cells and organisms. In principle, improving the cells’ ability to deal with misfolded proteins should represent a generic approach to reduce pathology in diverse protein misfolding diseases. The MRC Laboratory of Molecular Biology has identified powerful strategies to help cells survive when protein quality control fails, implementing some of these strategies in mice. Exploiting the current knowledge on protein quality control systems, a small drug-like molecule that safely boosts the natural defence system against misfolded proteins, has been identified. “We are delighted to announce the talk from Professor Anne Bertolotti, MRC Laboratory of Molecular Biology, Cambridge. Professor Bertolotti has vastly contributed to our mechanistic understanding of pathological protein aggregation in neurodegeneration. Particularly, her revolutionary discoveries revealing phosphatases as druggable targets may help in the future to find new pharmacological interventions for age-related human diseases. 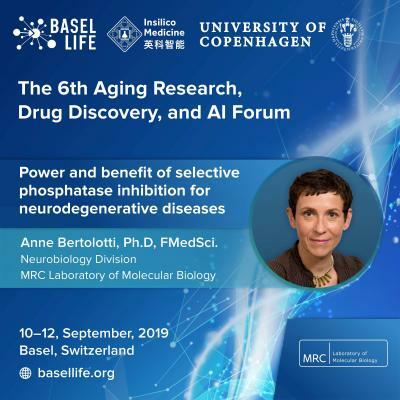 We are therefore extremely excited to welcome Professor Anne Bertolotti at the Aging, Drug Discovery and Artificial Intelligence meeting in Basel,” said Dr. Daniela Bakula, University of Copenhagen. The LMB is one of the birthplaces of modern molecular biology. Many techniques were pioneered at the laboratory, including DNA sequencing, methods for determining the three-dimensional structure of proteins and the development of monoclonal antibodies.